At Monday night’s meeting of the Portsmouth City Council, council reviewed several pieces of legislation for its respective first, second and third readings. Items include an ordinance authorizing the city manager to enter into a lease agreement for the Sunrise cell tower property, an ordinance authorizing approval of the preliminary legislation submitted by the Ohio Department of Transportation (ODOT) proposing to utilize a TAP Grant for the construction of approximately 1.25 miles of paved shared-use path along Front Street in central Portsmouth and the Shawnee State University campus, an ordinance amending a section abandoning animals of the codified ordinances of the city, and an ordinance authorizing the city manager to execute an agreement with Main Street Portsmouth for an additional three calendar years being 2018, 2019 and 2020 that would include supplementing an additional $5,000 to the annual contribution of $50,000 previously made by the city in years 2015, 2016 and 2017. All were moved as constituting their third readings. 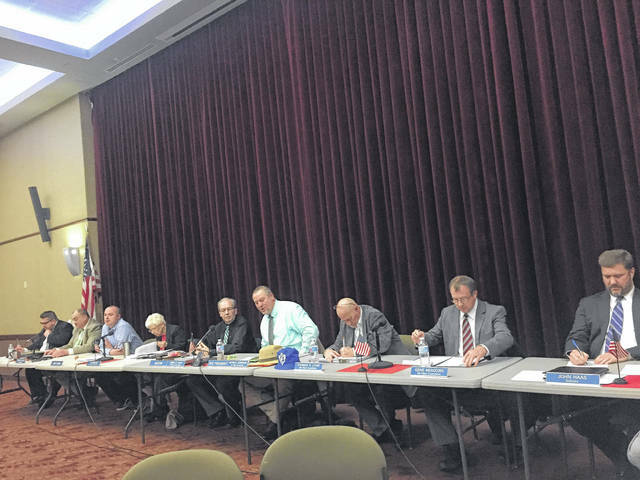 An ordinance authorizing the city manager to enter into an agreement to contribute $80,000 to Access Scioto County Public Transit in 2018, an ordinance authorizing the transfer of $15,028 from the General Fund to the Compensated Absences Fund, and an ordinance authorizing the city manager to enter into an agreement with Portsmouth Connex for Mound Park were moved as constituting second readings. New legislation items included an ordinance authorizing the city manager to enter into a 25-year easement agreement with the State of Ohio of real estate and planning, representing Shawnee State University, an ordinance authorizing the vacation of the alley between 3rd St. and Farney Ave. as requested by Steve Falls and Mike Stapleton on behalf of Sciotoville Christian Church. an ordinance authorizing the transfer of $21,739 from the city’s General Fund to Municipal Court Subsidy, an ordinance authorizing appropriations necessary for the implementation of agreed upon reclassification equity adjustments for members of AFSCME Local 1039-C per the Collective Bargaining Agreement ratified in 2017, and an ordinance to amend the salary ordinance as amended by Ordinance No. 2 of 2018 to reflect the reclassification equity adjustment agreement within the AFSCME 1039C Collective Bargaining Agreement to be effective Jan. 1, and to repeal Ordinance No. 2 of 2018 all received a first reading. Two more items added to Monday night’s meeting agenda were an ordinance repealing a motion taken Dec. 18 and repealing Ordinance 2018-01 regarding certain actions taken concerning the city manager, and an ordinance authorizing and directing an inquiry into the conduct of the city manager. These two items were requested to be passed as an emergency in accordance with section 12 of the city charter. Council voted to pass the ordinances, but first received some backlash from City Solicitor John Haas who had questions regarding the emergency status for the inquiry. Haas said he believed the ordinance did not fall under the guidelines for an emergency. Council members, alongside Kevin E. Johnson who has supported City Manager Derek Allen since his initial termination in December, said they believed the inquiry was necessary in order to be transparent to the citizens of Portsmouth and to allow both sides of the on-going dispute between City Council and Allen to be made public. Additionally at Monday’s meeting, Mayor James Kalb announced a meeting of the investigative committee looking into the allegations regarding Allen’s action would be held at 3 p.m. Wednesday in the City Building.